The most expensive ZIP code in America isn’t in Silicon Valley. It’s in Sagaponack, New York, the summer destination of Billy Joel and the Clinton family, among others. Here’s what the most exclusive communities in the country look like. San Marino isn’t just a tiny country neighbored by Italy — it’s also a wealthy community near Pasadena in Los Angeles County. Among its major attractions are the botanical gardens and art collection at the Huntington Library, which was formerly the mansion of a railroad baron but is now open to the public. Pacific Palisades is part of the city of Los Angeles, so it’s no surprise that plenty of celebrities choose to call it home. You may find that Rihanna or NBA superstar Blake Griffin is your neighbor. Arguably best known as the setting of the TV show “The OC,” Newport Beach is one of the most expensive communities in the country. ZIP code 92661 covers the Balboa Peninsula in Newport Beach, a small strip of land with some of the most incredible views (and property prices) around. 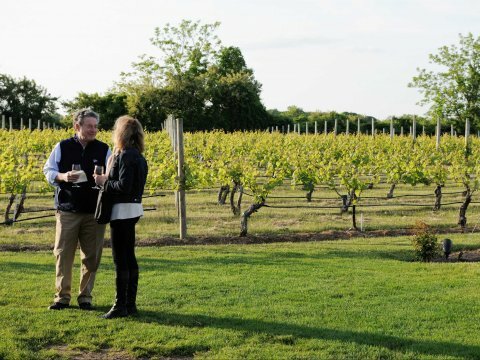 This Hamptons community is known for quiet and relaxation — not a wild party scene. If you can afford it, you’ll have your pick of incredible houses, such as this $38 million compound that belonged to hedge fund tycoon Jack Nash. This Orange County community is located just south of Newport Beach, and it is bordered by Crystal Cove State Park on one side and the Pacific Ocean on the other. It’s ideal for anyone who loves the outdoors — if you can afford it. Rancho Santa Fe has Bill Gates’ stamp of approval. Last year, the billionaire bought an $18 million horse ranch that formerly belonged to Jenny Craig (of the diet empire) and includes a race track, veterinarian’s office, and five barns. ZIP code 10282 belongs to Battery Park City, home to incredible properties such as this $118.5 million penthouse apartment inside the Ritz Carlton. The neighborhood is also home to Stuyvesant High School, New York’s best public school. Santa Barbara isn’t just one of the hardest places to buy a home — it also ranks in the top 10 most expensive cities to rent an apartment. With a mild year-round climate, mountains, and the beach, it’s no surprise that it’s become a desirable place for wealthy people to live. Like the neighboring communities of Menlo Park and Palo Alto, Portola Valley attracts a high-tech, high-spending demographic. In addition to being one of the most expensive areas to buy a home, 94028 is also one of the top ZIP codes when it comes to Tesla sales. Los Altos is the place where Apple began in a garage back in the 70’s, and it’s remained a haven for tech entrepreneurs. ZIP code 94022 includes the prestigious Los Altos Hills neighborhood, home to Google cofounder Sergey Brin. From contemporary art to the opportunity to live in Al Capone’s former mansion, Miami Beach has a lot to offer affluent property owners. And, of course, there are the world-famous beaches. Just slightly behind is ZIP code 10007, in lower Manhattan around the World Trade Center site. From there, it’s just a short walk to Wall Street, which explains the area’s appeal to high-paid traders. ZIP code 10013 incorporates three neighborhoods in lower Manhattan: Tribeca, Hudson Square, and part of Soho. In addition to views of the Hudson River, perks include having Beyonce and Jay-Z as neighbors. Home prices in Palo Alto have doubled over the last decade, thanks to the infusion of tech industry cash in the area. Mark Zuckerberg owns not just one, but five houses in the Silicon Valley town — in 2013, he bought four of his neighbor’s properties in order to preserve his privacy at home. Arguably the most famous ZIP code in the country, 90210 doesn’t disappoint. The Los Angeles enclave is home to celebrities like Tom Cruise and Manny Pacquiao, who bought his 10,000 square-foot mansion for a package deal of $12.5 million plus four tickets to his fight with Floyd Mayweather. Atherton is the most expensive ZIP code within Silicon Valley, and known as the home base of numerous tech executives. Notable residents include Microsoft cofounder Paul Allen, HP CEO Meg Whitman, and Google chairman Eric Schmidt. Beating out some of the most prestigious communities in the country, Sagaponack tops the list of most expensive zip codes in the United States. The Hamptons destination is home to jaw-dropping properties like billionaire Ida Rennert’s $248 million mansion, which has 12 chimneys, a two-lane bowling alley, and a 100-car garage.